Stack is the vertical distance from the center of the bottom bracket to the top of the head tube. The horizontal counterpart to Stack is Reach. Taken together, the reach and stack dimensions are very useful values to consider when comparing one frame to another. There is less ambiguity when looking at stack and reach than at seat tube length and top tube length as the two latter dimensions are often measured in different ways. 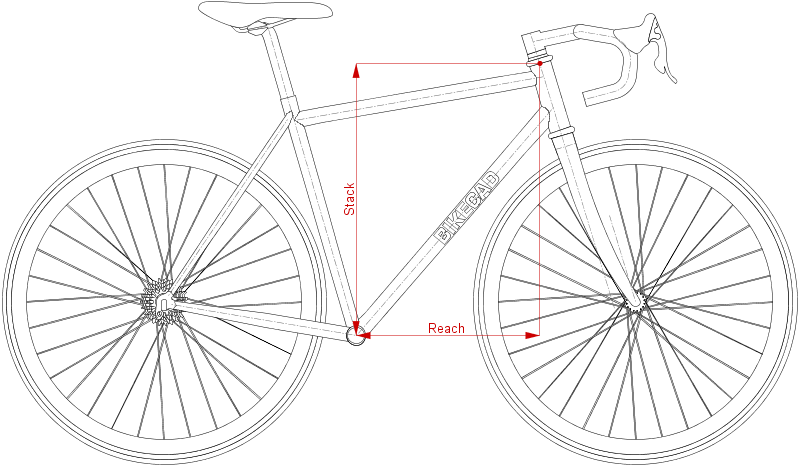 The BikeCAD Design Archive can be searched according to reach and stack values. This allows you to easily find a variety of similarly sized bikes for comparison. Be aware that stack and reach are also dependent on fork dimensions and the lower stack height of the headset used. Stack can be directly controlled in BikeCAD as described at: bikecad.ca/toptube_frontcenter.